@Anna N Thanks for this, I've saved the ribs recipe. isnt that clearly contrary to the IP ‘rules’ in their directions to never have less than 1/2 cup (or was it even a cup?) of liquid in it for pressure cooking? he chose to run out to a tree and pick a Persimmon. Dinner last night was an Instant Pot recipe for short ribsr and it was amazing. I'll be having some of the leftover beef as well as the mashed potatoes tonight along with a slice of my freshly baked bread. Can't wait for my IP corned beef dinner coming soon. I have some lamb shanks that I plan on doing in the IP. I plan to brown them stovetop first and the finish the braise in the IP. Any suggestions for how long in the IP? @chileheadmike I follow a recipe posted on pressurecooker.com except I cook them on high pressure for 45 minutes, NPR. Total time 2 1/2 hours. I use beef broth instead of the bullion cube. I think that I would start them out at 30 minutes. You can always cook them more if they need it but you can't cook them less once it's done. I found that out to my detriment a while back when I cooked some little pork ribs. I wound up with delicious flavored sticks of wood. Even lamb shanks can be quite delicate. @ElsieD looks good. So I have one for 30 and one for 45. I'll split the difference and use the natural pressure release. I have some Weisenberger grits that will make a nice side. Please let us know it turned out. Thank you very much for the warning. I have been hearing about this for a few weeks now and I really respect the company for getting the word out promptly and thoroughly. This is a quote from the article and I have seen it in every notice that I have read. “We want you to know that we take any problem with our products extremely seriously as safety and quality are our primary concern,” the company said. This is from a company that has done no advertising and has let their product be sold completely by word of mouth but when something goes wrong they are very vocal. This doesn't relate to the Instant Pot Pressure Cookers that almost all of us have. The problems are with some of their Gem cookers, which are not pressure cookers - they are more like slow-cookers with additional heating elements or something. Lamb shank. Onion, garlic, Dijon mustard, white wine, chicken stock, and rosemary. 45 minutes, natural release. How can Bittman's shrimp not be over-cooked? Will he have an IP recipe for flounder next and claim it's perfect ? Am I all wrong here? It looks delicious and it looks like 45 minutes was just right. 45 was probably right. Could have gone a little longer even. No, it seems to me that they would be either like rubber tires or mush. I just threw out a pressure cooker book that someone gave me. It had a recipe for cooking sole for 10 minutes in the pressure cooker. Yuck! That was my suspicion. 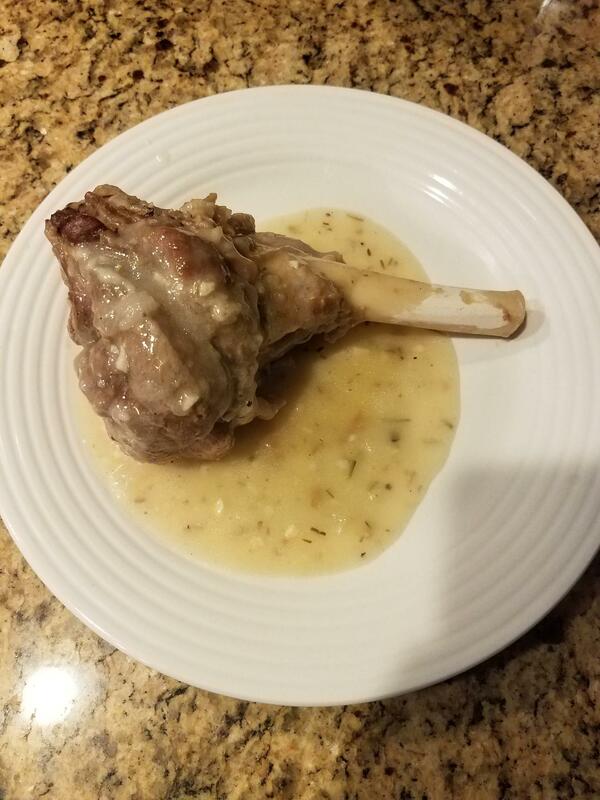 I had advised someone else that 45 minutes seems like a good idea but she felt that it was not long enough for the kind of consistency one hopes for in a lamb shank. I suspect it may also have something to do with size/age of the animal. Yours looks to be quite large for a lamb shank. I did not jump in before because it was only secondhand knowledge. How can Bittman's shrimp not be over-cooked? I edited my post to say "except" as I realized later the recipe has you cook them for less time than 45 minutes. If you cook them for longer next time, I'd be interested in learning how you like them. I like them at 45 minutes, but that's not to say I wouldn't like them even better cooked longer. They were large. They were cooked all the way through but some of the fat had not rendered. Another 5 or 10 minutes and I think they'd be right there. Moderately interestingly, I saw a video online with what looks to be nearly identically "Bittman's" shrimp recipe... and the guy in the video used frozen, cleaned shrimp. Which makes much more sense (if that entire nonsensical recipe idea can be categorized so)... the frozen shrimp give off all that water that's missing, and, starting from being that cold, don't overcook. still the result was a wet mess... nothing at all like the garlic butter sauce I would call a "Scampi" style shrimp. and overall, the method calls for doing 5-10 minutes of cooking on sauté mode, and then the '1 minute'' under pressure; which seems ridiculous to me anyway, because after all that sautéeing, I could just add fresh shrimp to the pan and have them done in a minute or two at most on the heat anyway. there isn't anything being gained by doing it under pressure. I certainly haven’t tried this yet but if you read the headnote to the recipe it is claimed that texture of the cooked shrimp makes it a worthwhile method. There is nothing to suggest that the shrimp used by Bittman are still frozen. Personally I’m intrigued but not quite enough to risk one and a half pounds of very expensive shrimp to find out it doesn’t work. Is there any seafood dish worth doing in the IP (other than seafood stock)? Octopus maybe? Sounds like by the time anything even gets up to pressure, it'll be beyond dead already. I've done three seafood things in the IP. I can get good quality frozen chunks of tuna and salmon here. I put them, still frozen, any steamer basket and cooked them for one minute. The tuna I used in tuna salad in half an avocado and the salmon I used in salmon cakes. They were both cooked perfectly and delicious. The other was Cioppino. However I made the base in the pressure cooker and finished the seafood in the base on the sauté setting on low. Other than octopus and squid I can't think of anything that could stand up to a pressure cooker and I'm not fond of either of those. I would even hesitate to make stock made from shrimp shells because I think it would be cloudy. Some things just aren't meant to be put in a pressure cooker.